Let them see you in all your glory. Or your money back. No fine print. and judging by the acceptances, effective!" – Valerie M.
Admission essay tutor Anna Sharp has 14 years of experience in publishing and education. 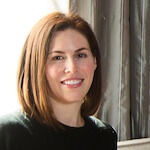 For The Oprah Winfrey Show, Anna combined her love of teaching and the written word as associate producer for Oprah.com, helping create the first online classroom for Oprah’s Book Club (“A Summer of Faulkner”), as well as editing monthly O, The Oprah Magazine content. Anna’s articles have been published in Men’s Health, Shape, Budget Travel, and Caribbean Travel & Life. Before she was a college essay tutor, Anna authored non-fiction for young adults (Morgan Reynolds Publishing) and a series of books for teachers (Carson-Dellosa Publishing). An enthusiastic supporter of her alma mater, Duke University, Anna has served as an interviewer for the Duke Alumni Interview Board and is active with the Duke Alumni Development Council. She attended Duke on a full academic scholarship. With expertise in both undergraduate and graduate admissions, college essay tutor Anna Sharp advises both freshman and transfer applicants as well as students applying to professional school, residency, fellowship, and accelerated medical degree (BS/MD) programs. Naked Essay never outsources clients to a recent grad or part-time college essay tutor. Students work directly with Anna throughout the entire process, receiving highly-individualized attention and tutoring tailored to their unique strengths, work habits, and learning styles. As a result, all Naked Essay students produce engaging, insightful, and effective essays and personal statements—we guarantee it. No fine print! For more information about our services, please use the contact form below, email anna@nakedessay.com, or call/text 878-444-0455.